Celebrate with Pogo – Happy World Vegetarian Day! It’s World Vegetarian Day today, established in 1977 to “promote the joy, compassion and life-enhancing possibilities of vegetarianism.” We’re marking the occasion with a healthy and nutritious serving of Tokens for herbivores and carnivores alike. Plants vs. Zombies will put you in the mood for salad and earn you 2,000 Tokens. 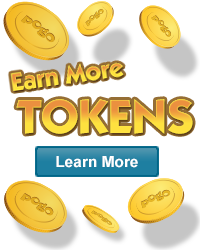 Club Pogo members can escape to the great outdoors of Everyone Wins Bingo for 2,000 Tokens in each! Think fast and plant faster to stem a zombie attack and save your home!